It’s just about Thanksgiving already, and I'm trying to keep it healthy around here, which isn't too hard when I keep the pantry filled with things like winter squash, apples, citrus, onions, kale, rice, tofu, beans and toasted nuts and seeds. But come next week, I'm sure there will be cookies, candy, meat and dairy looming. 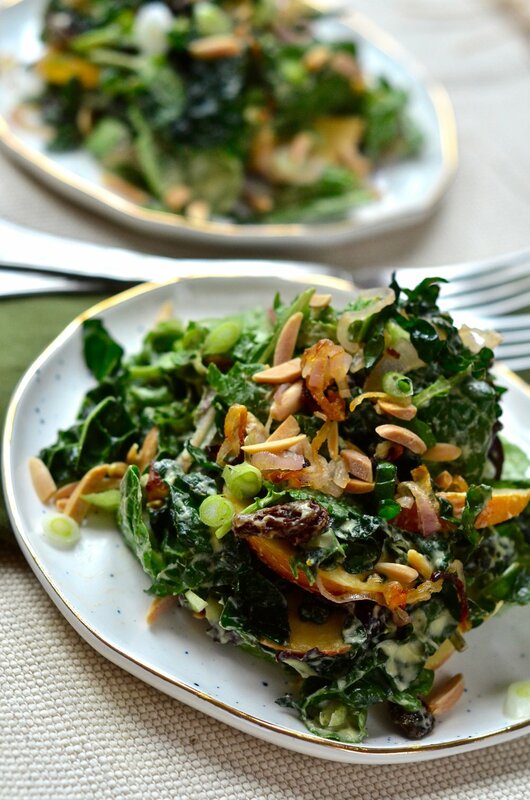 In that case, this kale and apple salad makes a perfect addition to the Thanksgiving menu. It's fresh, full of seasonal (Autumn), local produce like apples, kale and onions. Not to mention, it’s also high in antioxidants, fiber and healthy fats. No grains, refined sugar, dairy, cream or mayonnaise in this recipe. It will add a lovely punch of color to your overall Thanksgiving table as well. Have you noticed that most of the traditional Thanksgiving dishes are white or brown? Turkey, ham, mashed potatoes, gravy, onions, rolls, rice, and even marshmallow yams and creamed corn are dull in color. Make it your job this year to be sure to balance each white/brown dish with something colorful, bright and fresh. There are so many ways to make lasting memories with healthy plant-based foods (no just unhealthy foods) like roasted brussels sprouts or carrots, chopped kale salad, butter lettuce salads, baked acorn squash, steamed asparagus, mashed sweet potatoes and so on. In a Vitamix or high speed blender, blend well until smooth (as shown in photo). On a baking dish, place the slivered almonds. Bake for 10 minutes or until golden brown. Remove apple cores or cut in half and slice around the core and seeds. Chop apple into small pieces or wedges. Set aside and sprinkle with lemon juice from half the lemon. If you’re using lacinato kale, remove thick stems and chop the leaves very finely. 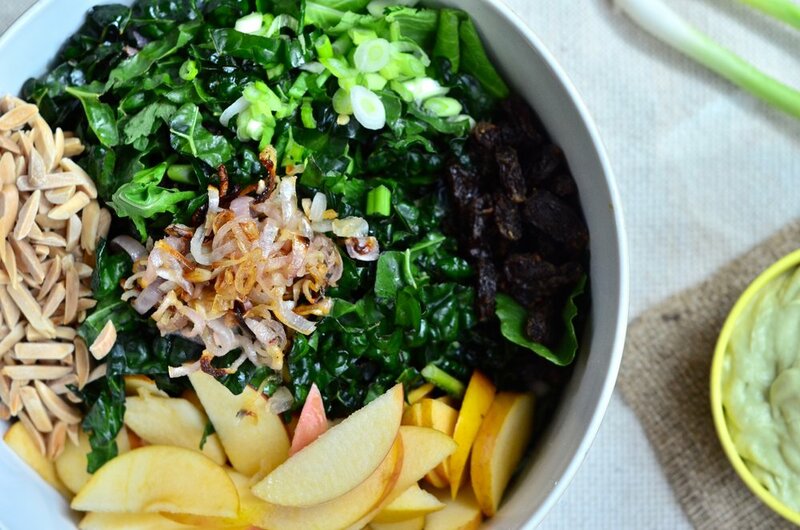 Put kale in a bowl, sprinkle with half the lemon juice. Toss and set aside. Chop shallots into thin slices, and coat with olive oil and honey. Bake in the oven for about 10-15 minutes. Check on them every five minutes, tossing to prevent burning. Meanwhile, chop scallions into thin slices as garnish. In a large salad bowl, combine all of the ingredients together and toss. Add the avocado dressing and toss again. Posted in Dinner, Lunch, Fall, Thanksgiving, Raw Food and tagged with fall produce salad, fall salad, avocado dressing, apple kale salad, kale salad, grilled onions, creamy avocado dressing, vegan dressing. November 16, 2016 by Juli Novotny.